Background: Retinal neovascularization (NV) is the leading cause of blindness in the majority of ocular diseases. Several treatment approaches have been developed for retinal NV; of these methods, instillation of nanoparticles into the conjunctival sac has shown potential for retinal NV treatment because it does not cause physical damage and is easy to operate. 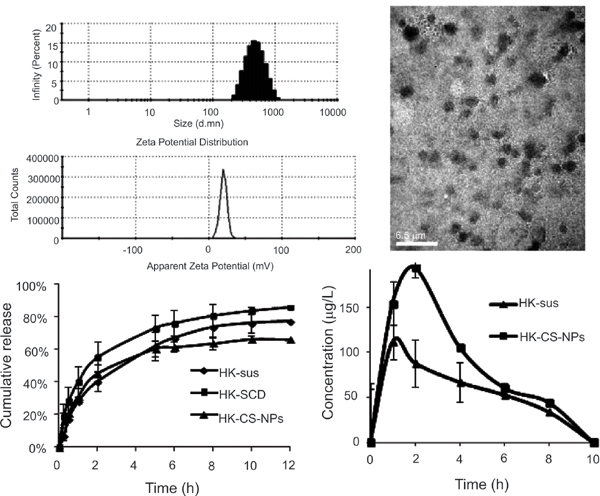 Methods: In this study, honokiol-loaded chitosan/sulfobutylether-β-cyclodextrin nanoparticles (HKCS- NPs) were prepared for ophthalmic drug delivery systems. An inclusion complex of honokiol and sulfobutylether-β-cyclodextrin was used to incorporated insoluble honokiol into chitosan nanoparticles, which were prepared through ionotropic gelation. Results: HK-CS-NPs featured a spherical surface with a narrow size distribution of polydispersity index less than 0.250, a mean size range of 373–523 nm, a positive surface charge of +19.9 to +24.2 mV, and an entrapment efficiency of 84.92%. In vitro release studies showed an initial burst release phase and a sustained release phase of nanoparticles. Moreover, in vivo study showed that HK-CS-NPs exhibited good ocular tolerability and could improve ophthalmic bioavailability of honokiol. In particular, the maximum concentration of honokiol after administration of HK-CS-NPs was enhanced by 1.65 times compared with that after instillation of the honokiol suspension alone. Conclusion: This study proposes HK-CS-NPs as a potential ophthalmic delivery system. Keywords: Chitosan, honokiol, nanoparticles, ocular drug delivery, retinal neovascularization, sulfobutylether-β-cyclodextrin. Keywords:Chitosan, honokiol, nanoparticles, ocular drug delivery, retinal neovascularization, sulfobutylether-β-cyclodextrin. Abstract:Background: Retinal neovascularization (NV) is the leading cause of blindness in the majority of ocular diseases. Several treatment approaches have been developed for retinal NV; of these methods, instillation of nanoparticles into the conjunctival sac has shown potential for retinal NV treatment because it does not cause physical damage and is easy to operate.